We have recently added a new case study to the website to try give you an idea of the type of work we have done and therefore could do for you. It’s not always as simple as choosing a basic blind to fit in a small rectangular window recess but this shouldn’t put you off enquiring as to what you can have installed. We will always work with our customers to understand their requirements to be able to give them the best options to choose from. 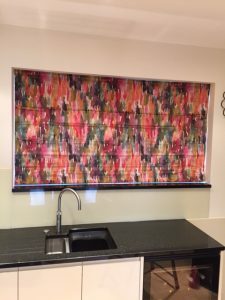 For this case study, the requirements were for a very bright and colourful roman blind which they ended up providing their own fabric they had seen and we made it up into blinds for them. We were also able to position the fittings to allow the blinds to hide the fact that the bay window area sloped quite dramatically at both ends and cover all the fittings up with the pelmet made from the same fabric. The customer was not aware we could make up their own fabrics and that we would be able to disguise the window area not being square without the need for costly building work. For more information on Roman blinds please click here. If you would like to contact us regarding these products or any other products and services we offer please click here.